Woohoo! It's time for a blog hop! This hop a fun way for the Dream Team to craft and, hopefully, inspire everyone while also giving all who comment a chance to win some prizes along the way! For my card I have used Lemons from Mo's Digital Pencil. I have used some digital papers from Sweet Shoppe Designs, it was one of their freebies. It was my first time working with digital papers and it came put pretty nice as it came with ephemera like the postcard and stamp I used. In the corner I used a Joy! corner die and applied some Viva Pearl pen to jazz it up. Wild Orchid flowers were used, of course! My natural instinct was to use yellow as a main color being that the image was called Lemons, but I thought I would steer away from that inclination and use green and pink, which I am really pleased with! You should have come from Anneke's blog if you are hopping along. If not you will want to start at Jak's blog. Your next stop after me is Kaly, so keep hopping! And don't forget to leave comments at each stop as there are prizes to be won somewhere along the way!! Wonderful card, love the colours and layout. I think you maybe a head of the rest, doesnt appear to be anyone else with links on this hop. what a nice card , i love this stamp. I love this card. It is just what kids try to do...all at once. A little cutie too. I like the colors you chose for her,the glimmer of pink in her hair. I helped raised 3 girls, they all love flip flops lol. Oh what cutie and absolutely gorgeous card. Oh she is so cute. Such a sweet card - love the color-combo. Beautiful!! Hope the lemonade tasts great! Beautiful,Danielle! Everything fits so nicely together on your card. Love the color combo and the coloring is just fantastic! Papers are great! Ah....lovely colour combo! Looks awsome! I Love the colors and that sweet sweet image. Oh, you've colored it so lovely!Respect! The whole feeling of the card is so delicate and fine! 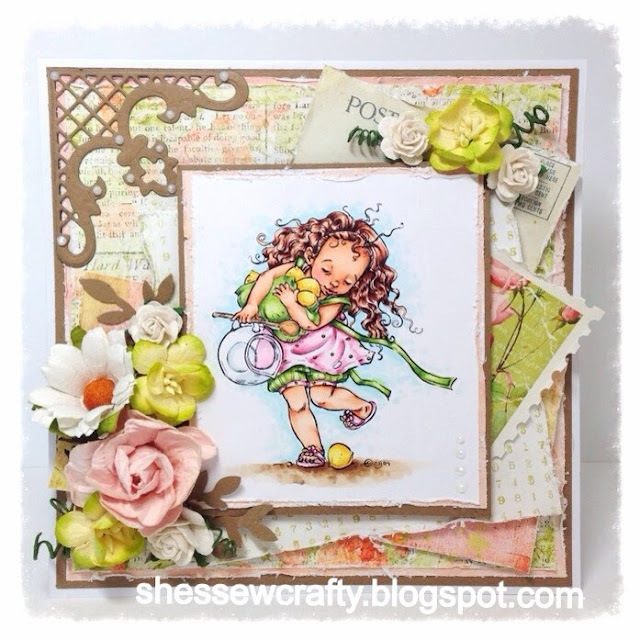 A beautiful card, adorable image and lovely soft colour palette. Your beautiful flowers are the perfect finishing touch. I'm glad you did the green and pink too, it's gorgeous! The embellishments give it an almost vintage feel that I love. Such a cute image and beautiuflly done. Beautiful job. Love this digi... great job colouring it. Beautiful card and amazing coloring!!!! What a beauty. So cute and nice colors. Where to begin. I love it all -from the tiny white roses to the DP and your coloring is fantastic. Such a sweet card! I love the bit of distressing. What a beautiful card. The image is sweet and the background papers are so subtle which set the embellishments off nicely. So pretty! Such a sweet card and lovely colouring! Love everything about your card. The image, your coloring is superb, all the layers and tiny details. Fabulous card, beautifully coloured and great design. The color combinations match perfectly with your image - lovely! Wishing you a happy day! Your card is beautiful ... love Mo's image. |Thanks you for joining TTCRD this week. Great card! I love how you shade and how you colored her hair! Thanks for sharing this gorgeous card with us at Creative Craft Challenge. Stunning creation! I adore the coloring you did for this! Thank you for joining us this week at the Crafty Sentiments Designs Challenge! I hope you play along with us again soon! Such a beautiful card you have made, love the image which you have coloured so nicely. Thank You for sharing with us at Lady Anne's Challenges. I hope we see you again soon. Great project fab stamping !